Complimentary design services for your retail wine shop or restaurant. 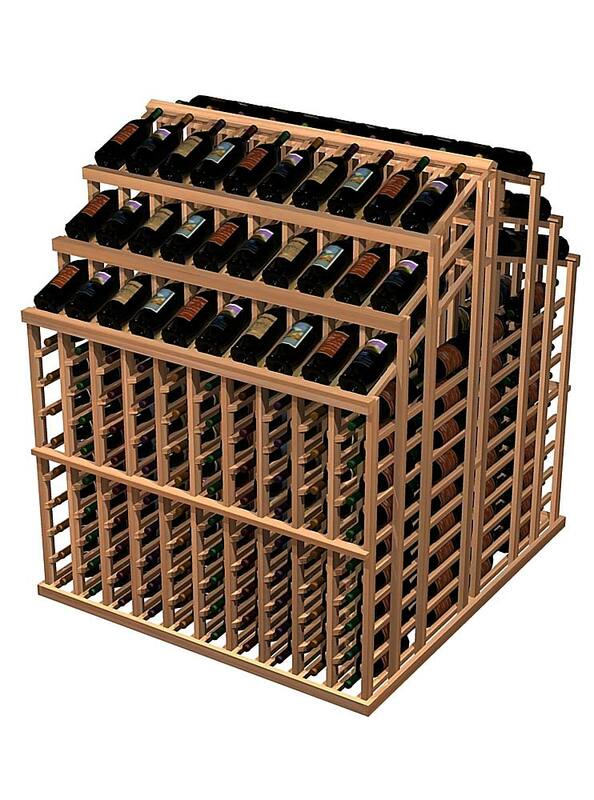 Wine racking is designed to display and merchandise your inventory. 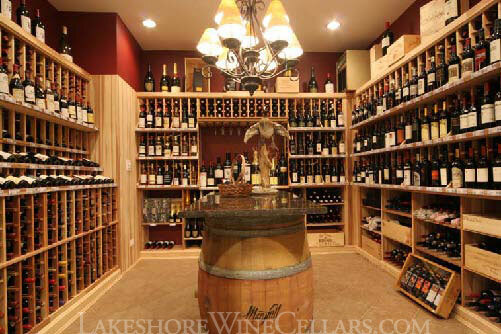 Custom wine cellars for presentations and sales to your most discriminating customers can be built within your store. See examples of Pam's designs in the Chicago area and downstate Illinois "Binny's" stores. 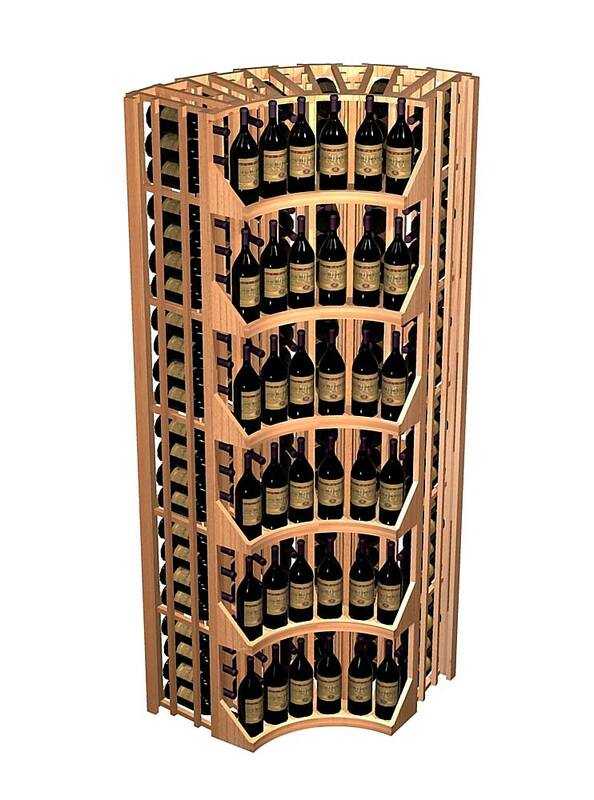 Triple Tier Merchandiser Features: Versatility is what the triple tier wine merchandiser commercial wine display has to offer. Each wine display bottle is in the optimal visual range. For store owners wanting volume sales, you can display 3 of the same bottle per column with 18 bottles individually stored below. For store owners looking to maximize labels, you can display 30 different bottles with 6 of each individually stored below. 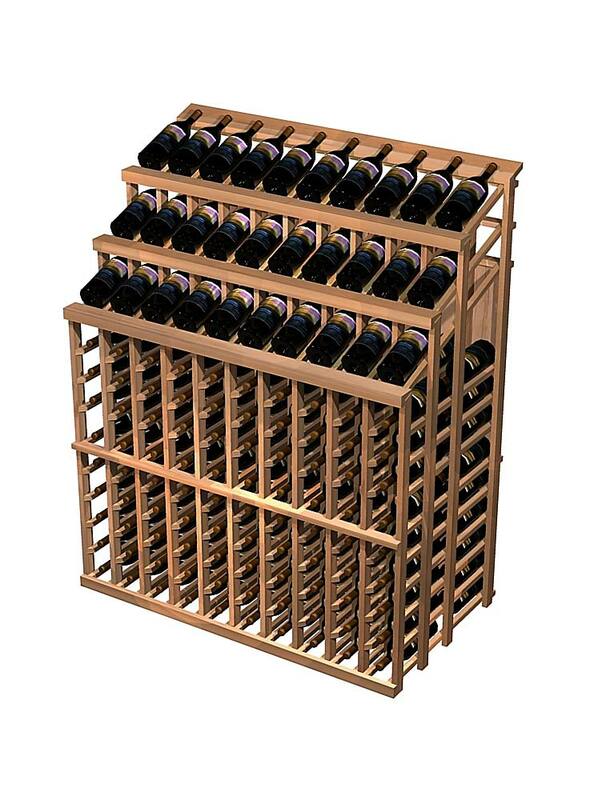 Wine racks are spaced to accommodate standard wine and champagne size bottles. Assembly required. 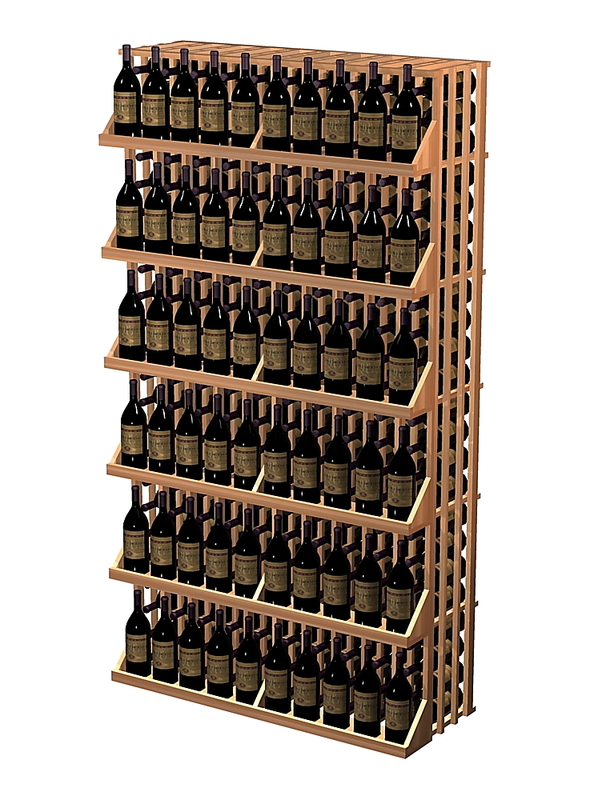 Triple Tier Maximizer Features: The triple tier maximizer wine display is designed to maximize displays and storage on your ever shrinking floor space. Each wine bottle is displayed in the optimal visual range. For wine store owners interested in volume sales, you can display 4 of the same bottle per column with 24 bottles individually stored. For store owners looking to maximize labels, you can display 40 different bottles with 6 of each individually stored. 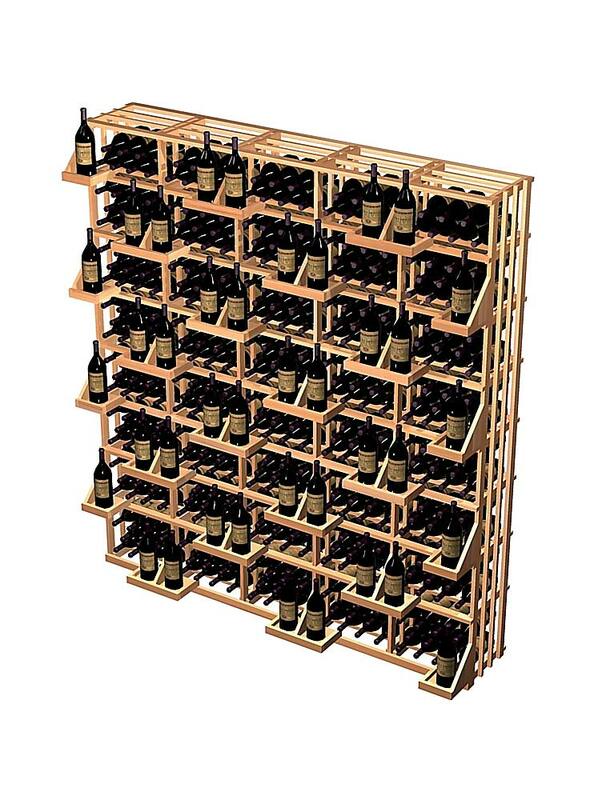 Racks are spaced to accommodate standard wine and champagne size bottles. Assembly required. 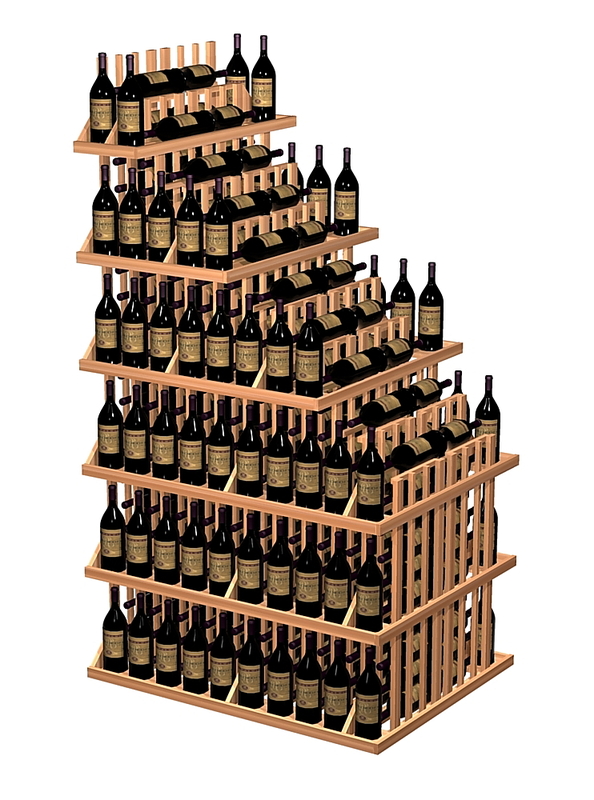 Two Tier Magnum Merchandiser Features: A size often overlooked by store owners, magnum wine bottles are more popular than ever. The two tier magnum merchandiser wien display allows wine store owners to display 2 of the same bottles per column for high volume wine sales or 2 different bottles for a larger selection of wine. 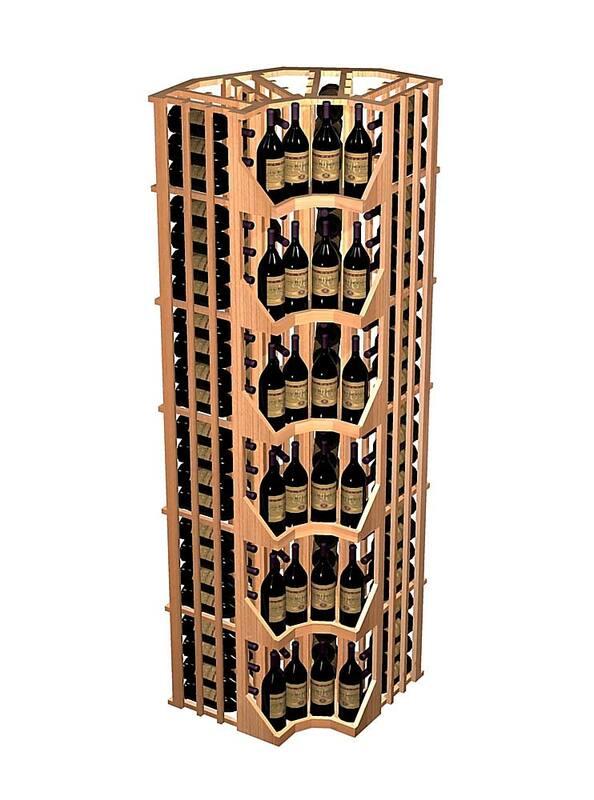 All bottles are individually stored for greater stability. Assembly required. 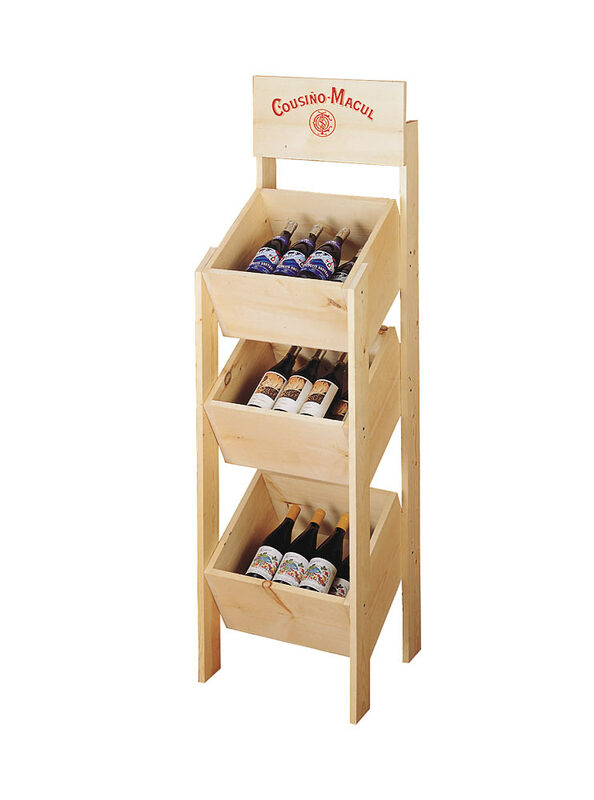 Country Pine Triple Bin Display Features: Ideal for continuous label visibility. As the top bottle is sold, the next label is shown without the need for restocking. Display headers come blank standard, but for a minimal upcharge, laser engraving of your text or logo is available. Two Tier Island Features: The Two Tier Island wine display is the newest addition to our commercial wine rack line, and offers another way for wine store owners to display and store wine. The visibility of 40 more wine labels in your store can easily translate into more wine sales. Island wine displays are commonly grouped together in rows throughout the center areas of wine stores. The height of this commercial wine rack is perfect for label visibility without blocking one’s view of the rest of the store. Assembly required. 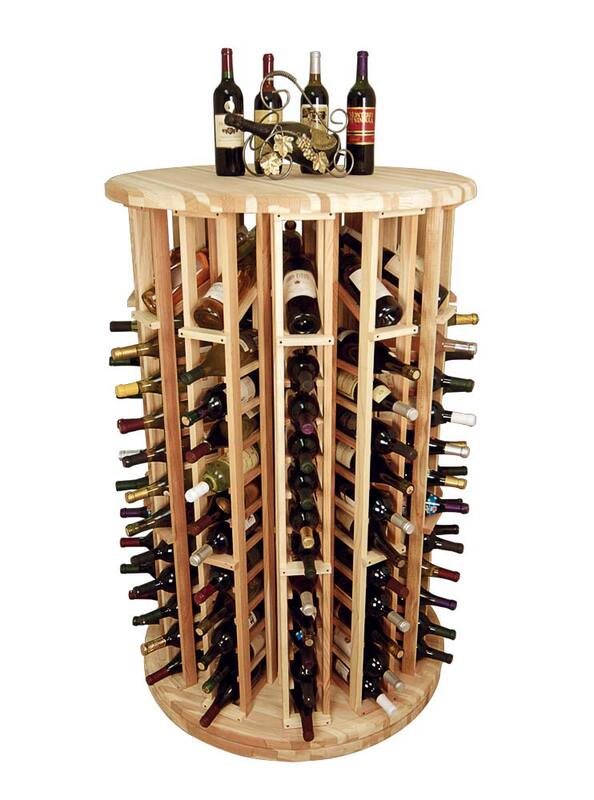 Triple Tier Island Features: Versatility is what this wine storage unit has to offer. Each wine display bottle is in the optimal visual range. For store owners wanting volume sales you can display 3 of the same bottles per column with 18 bottles individually stored below. For store owners looking to maximize labels you can display 60 different bottles with 6 of each individually stored below. Assembly required. 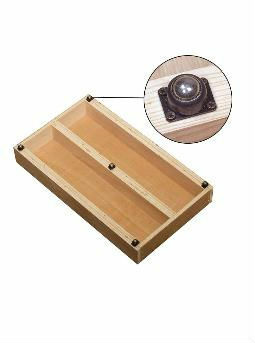 Island End Cap Features: With two fixed shelves and two adjustable shelves, this Island End Accessory Cap is perfect for marketing accessories or for more wine storage. Assembly required. Casters Features: The optional casters are designed to be utilized on smooth, hard surfaces that can be rolled into any location of the store. No more traffic problems when you have casters added to your island displays. 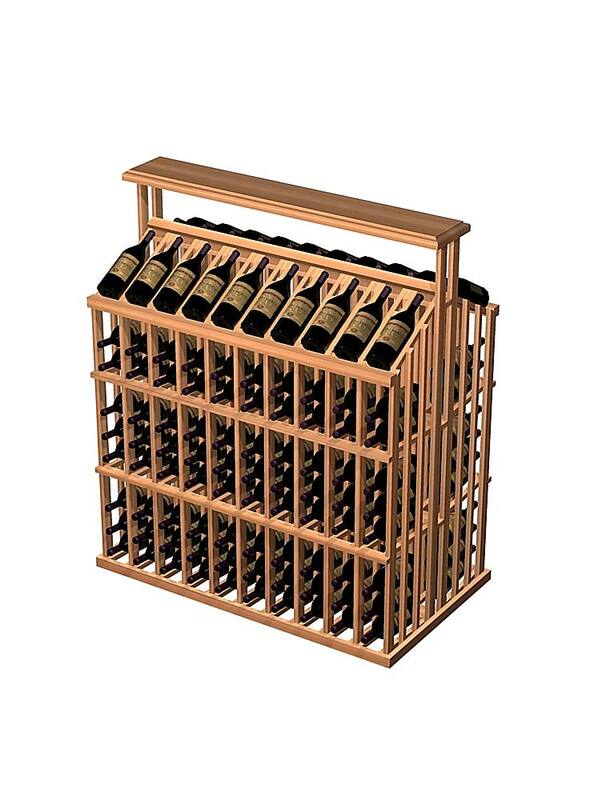 Caster placement varies in both location and quantity based on style of commercial wine rack ordered; Caster placement as indicated in the picture may vary per commercial wine rack. Horizontal Display - Vertical Bin Features: Your products will move best when customers can see the labels. 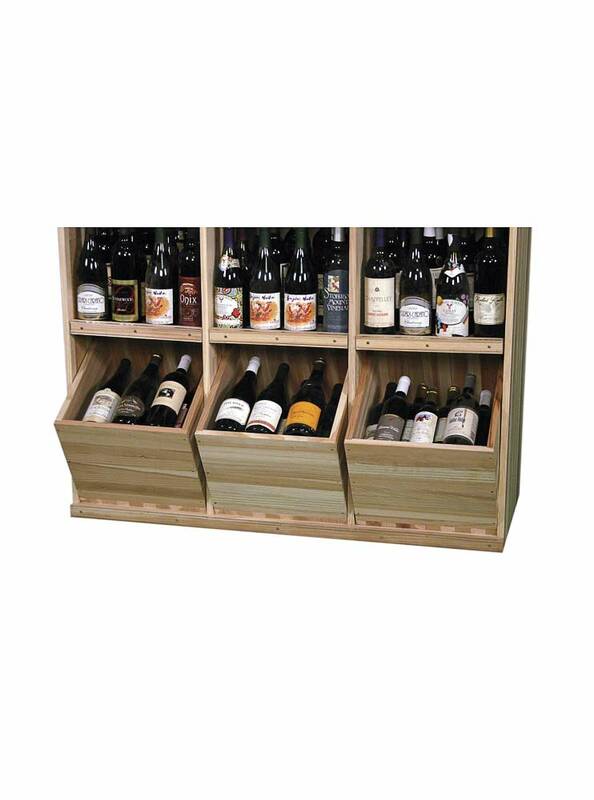 With this Horizontal Wine Display Bin you can display 50 different wines with great label visibility. Two Horizontal bottom wine displays allow for easy wine label recognition from standing height. Four wine bottles are stored behind each wine display, except for three stored at the top. Assembly required. 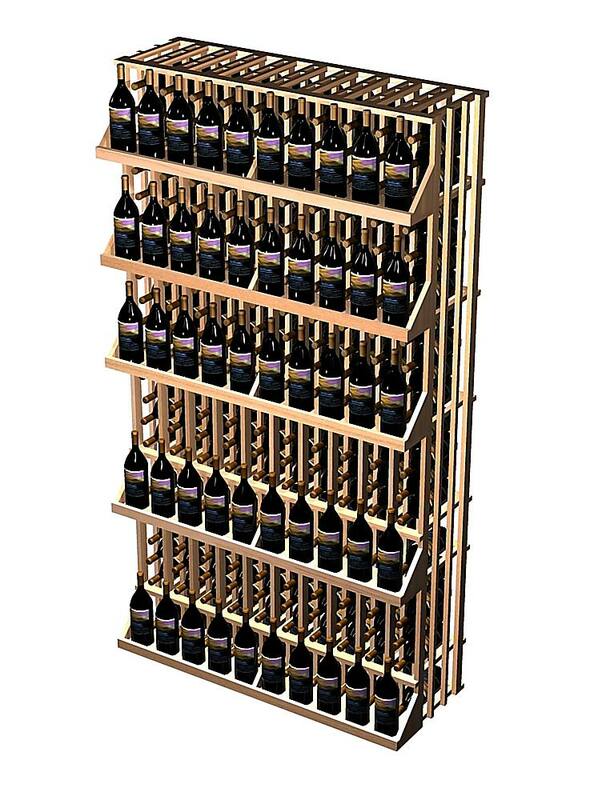 6 Shelf Vertical Bin Features: One of the most popular commercial wine display racks in our collection, the Six Shelf Vertical wine display is ideal for stores that want to maximize wine label visibility. One wine bottle is displayed prominently out front with storage for 4 wine bottles behind each display. In response to the evolving variety of wine bottles on the market today, we redesigned the distance between shelves to 15" to allow for taller bottles. 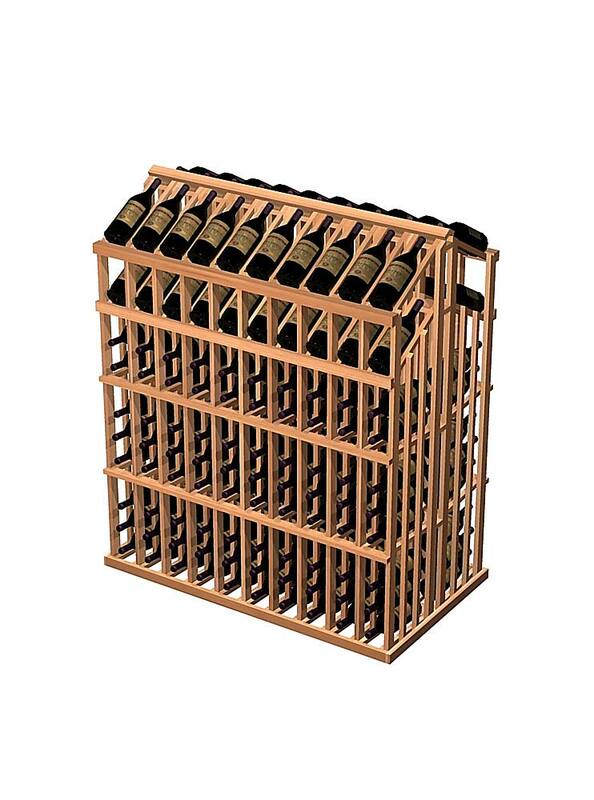 This has been one of the most popular commercial wine racks in our collection. Assembly required. Half Height Vertical Bin Features: The popular Vertical Wine Display Bin is now available in a half height versatile three shelf wine display variation. 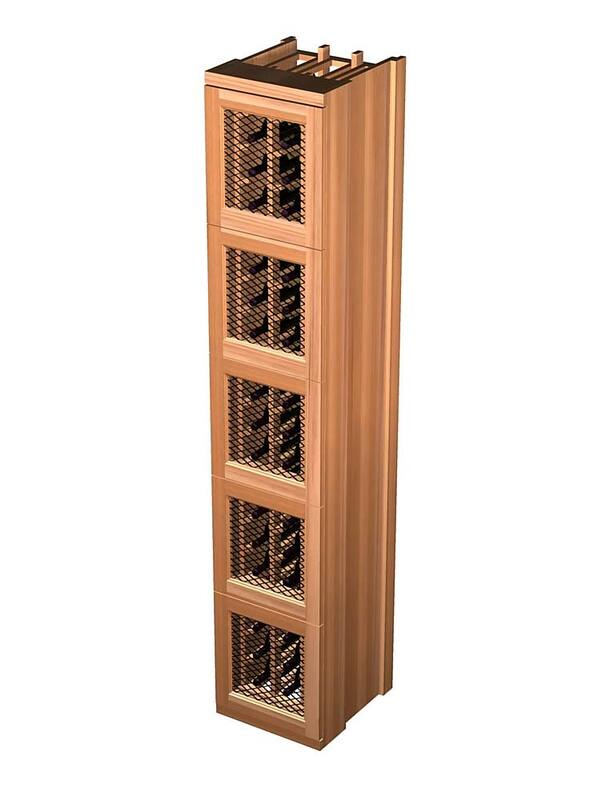 This commercial wine rack is designed to stand on top of our Half Height Adjustable Cabinet to match the other full height wine storage options. Assembly required. Waterfall Vertical Bin Features: Prominent, stunning, and functional, the waterfall wine display adds elegance to your wine store layout with a cascade of wine bottles displayed for attention-getting results. In conjunction with our curved corner wine displays you can make a sweeping transition from your wall wine storage pieces. Include the Waterfall End Cap Display for eye-catching results. Assembly required. 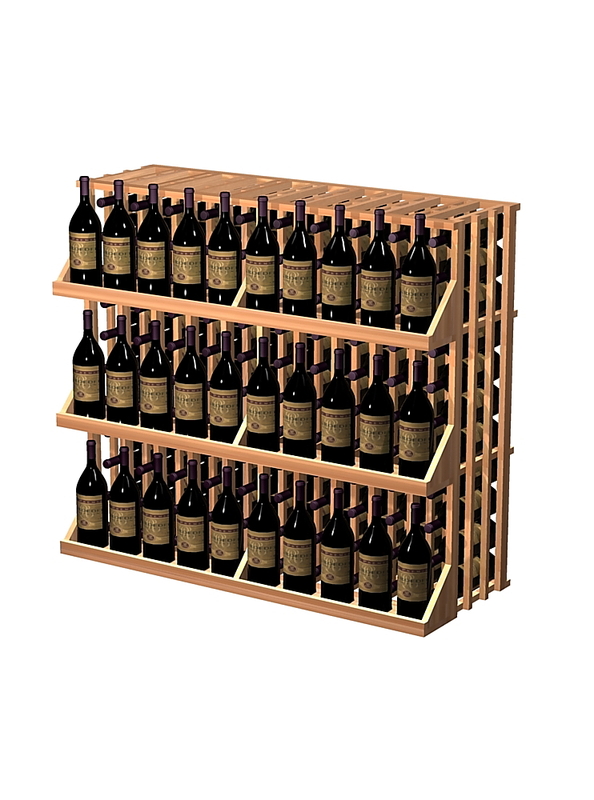 Height: 34 3/8" to 83 5/8"
Redwood Wall Display Features: Ideal for marketing your impulse wine sales, these stand alone wine wall racks bring focus to the fastest moving wines you have to offer. Placed near the check-out counter, this commercial wine display ensures last minute shoppers don’t miss out on your best product offerings. Assembly required. 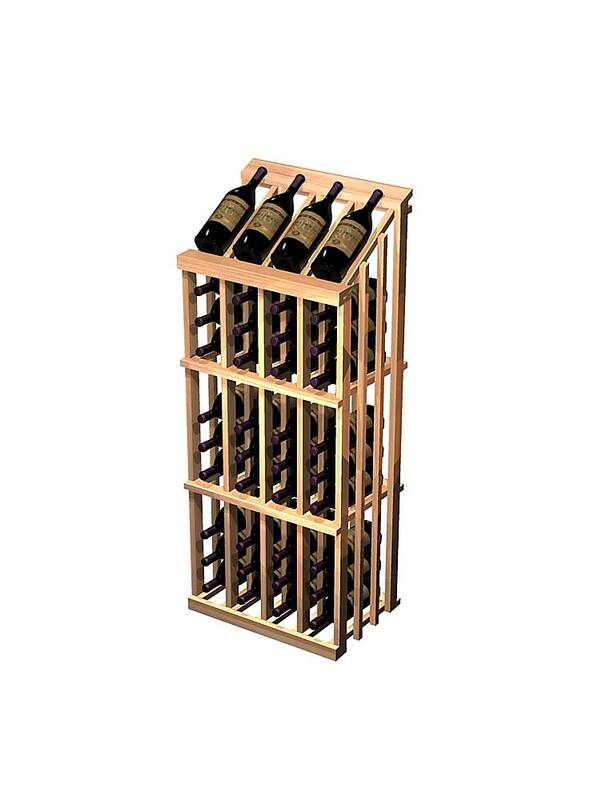 72 Bottle Merchandiser Features: Attractive and durable the 6 Column Wine Merchandiser is a free standing point of purchase wine display rack that is available in 3 popular sizes. Assembly required. 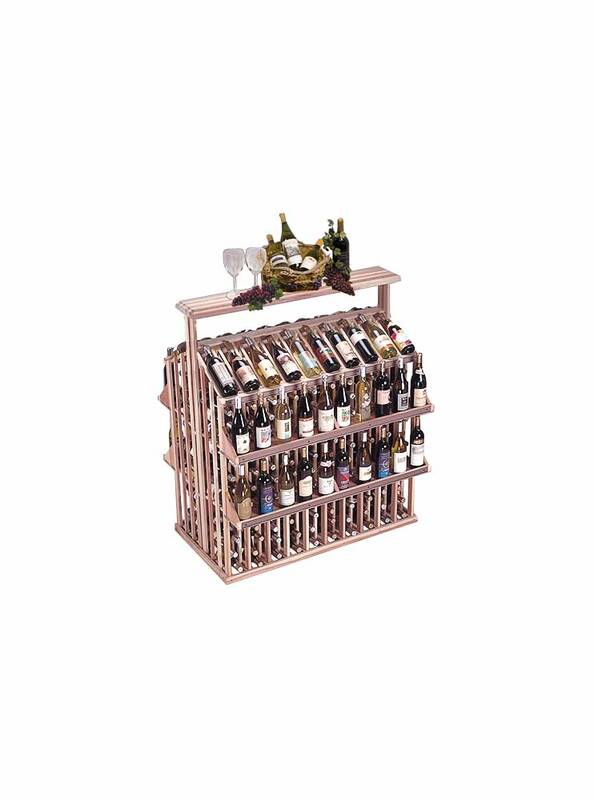 60 Bottle Merchandiser Features: Attractive and durable the 5 Column Wine Merchandiser is a free standing point of purchase wine display rack that is available in 3 popular sizes. Assembly required. 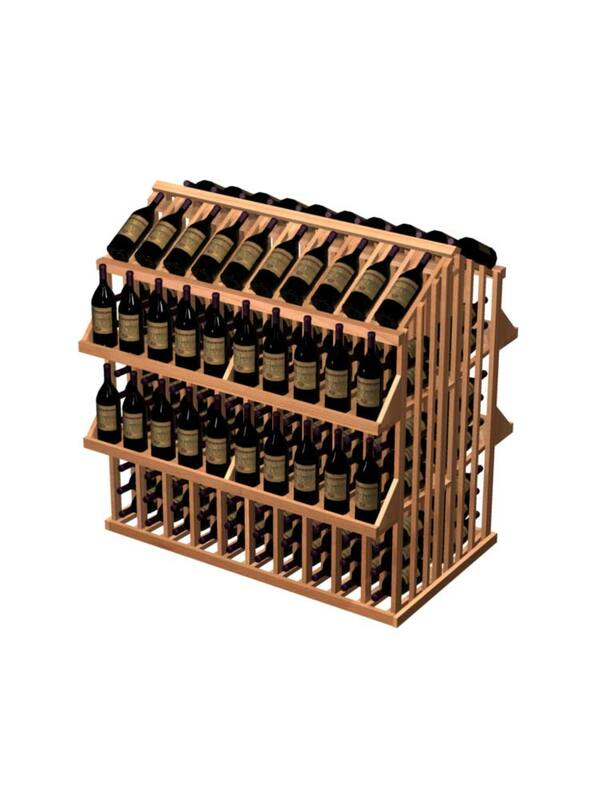 48 Bottle Merchandiser Features: Attractive and durable the 4 Column Wine Merchandiser is a free standing point of purchase wine display rack that is available in 3 popular sizes. Assembly required. 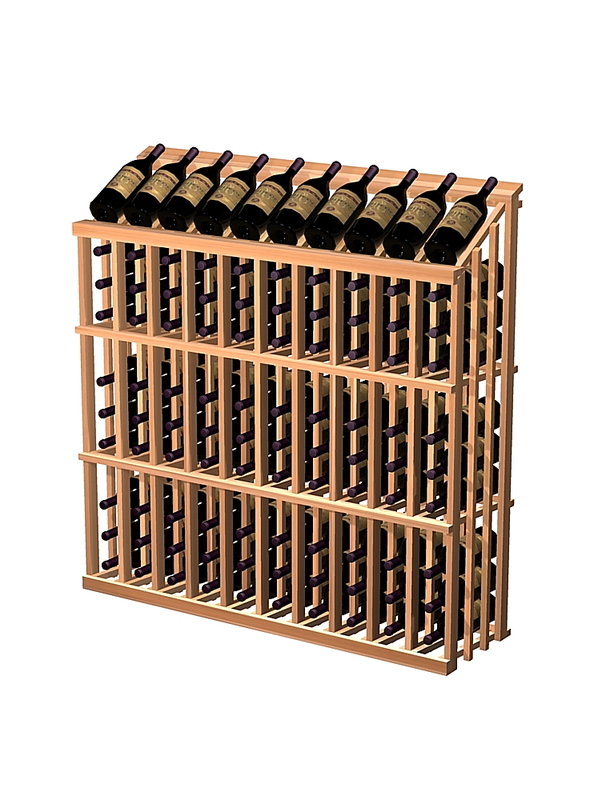 Basic Island Display Features: The Island is our most popular commercial wine rack. 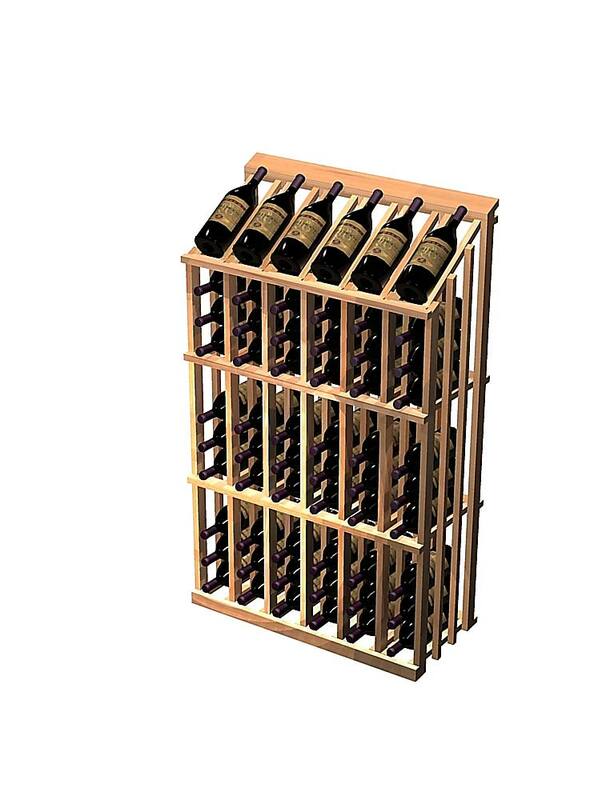 This sturdy, freestanding wine display rack can be placed in high traffic areas to stimulate sales. 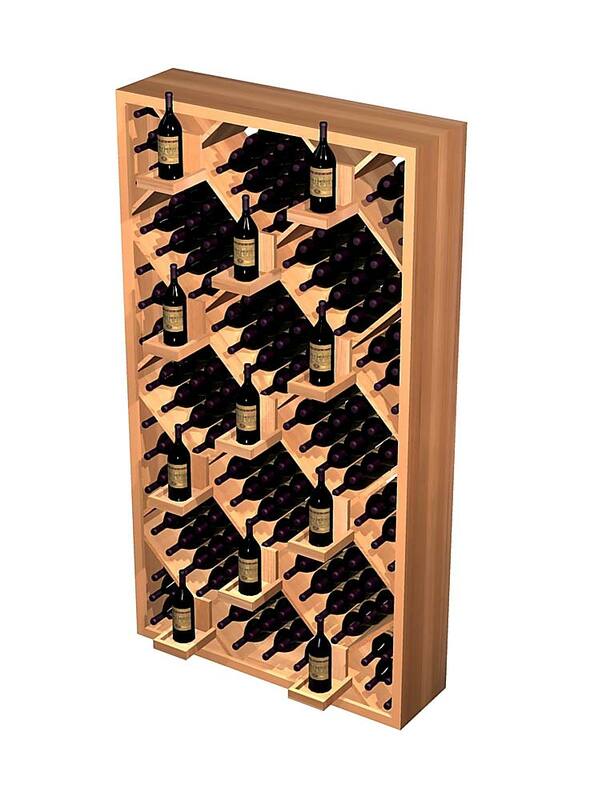 With each wine display there is wine storage for 11 bottles below creating the perfect setup for wine case merchandising. Island wine displays are commonly grouped together in rows throughout the center areas of wine stores. The height of this commercial wine display is perfect for wine label visibility without blocking one’s view of the rest of the store. Assembly required. Island w/ 4 Display Shelves Features: We have taken our most popular Island wine display rack, and added two shelves to each side to allow you more merchandising flexibility in the way you stock your wine store. The visibility of 40 more wine labels can easily translate into more wine sales. Island wine displays are commonly grouped together in rows throughout the center areas of wine stores. The height of this commercial wine rack is perfect for label visibility without blocking one’s view of the rest of the store. Assembly required. Island with Display Counter Features: Another option for the Island Wine Display is a top counter feature. The counter is 8" deep and can be used to market related items and accessories for more impulse buys. Fill the counter with high-margin product and you’ve created a profit source for your wine store. Assembly required. Island w/ 4 Shelves and Display Counter Features: The Island with Display Counter and 4 Display Shelves was designed by popular demand. Combining the 4 display shelves and a counter to our standard island wine display rack made it even more versatile and appealing to retailers who demand the most from their retail wine racks. Wine label visibility is at an utmost here. Assembly required. Fixed Display Shelf Features: For those customers who prefer the look of solid surfacing for their retail wine racks, we offer this attractive, interlocking, solid panel fixed wine display shelf. 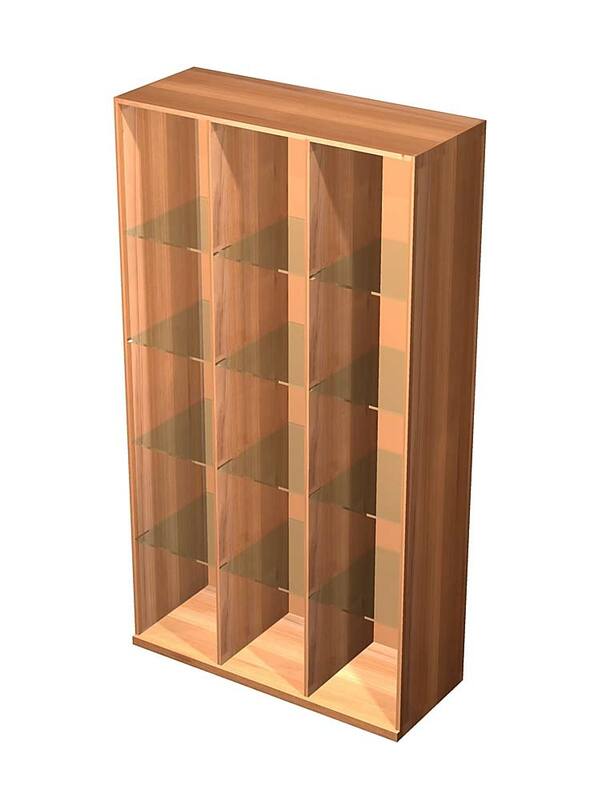 The shelving offers a total of fifteen separate compartments for a variety of wine or champagne bottle storage options. Assembly required. Adjustable Shelf Cabinet Features: An adaptable full-height commercial wine display cabinet, the adjustable shelf cabinet allows you to stock a wide variety of products. Perfect for wine, liquor, beer, soft drinks, or any other product you sell. 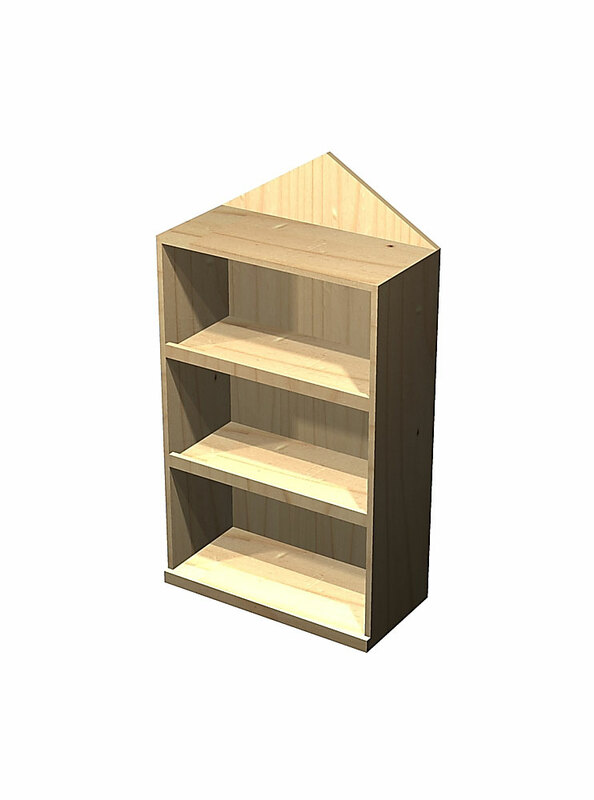 Middle shelves are adjustable to meet all your needs, and additional ones can be ordered. 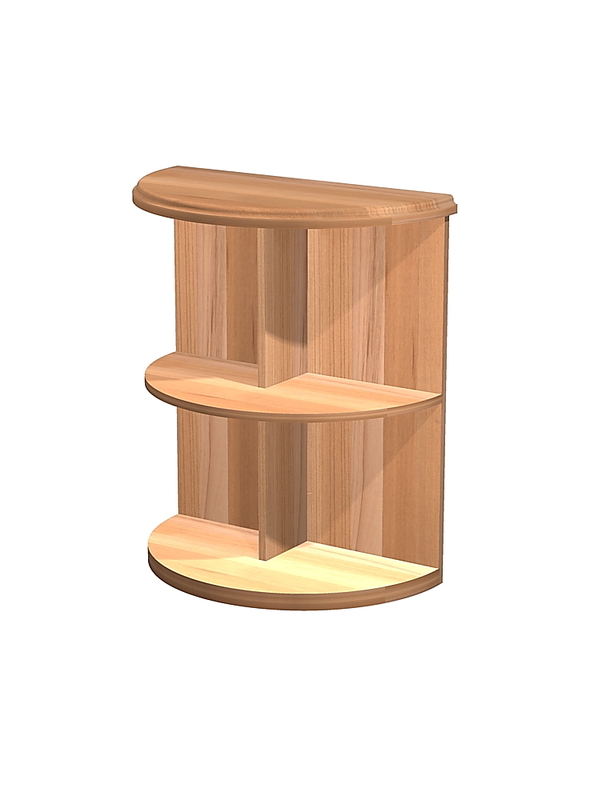 Designed with 1 7/16" solid redwood shelves that will hold up to 200 lbs., 1" thick sides and a 1/4" luan back. Optional Drop-In-Bins and Vinyl Bases are available. Assembly required. 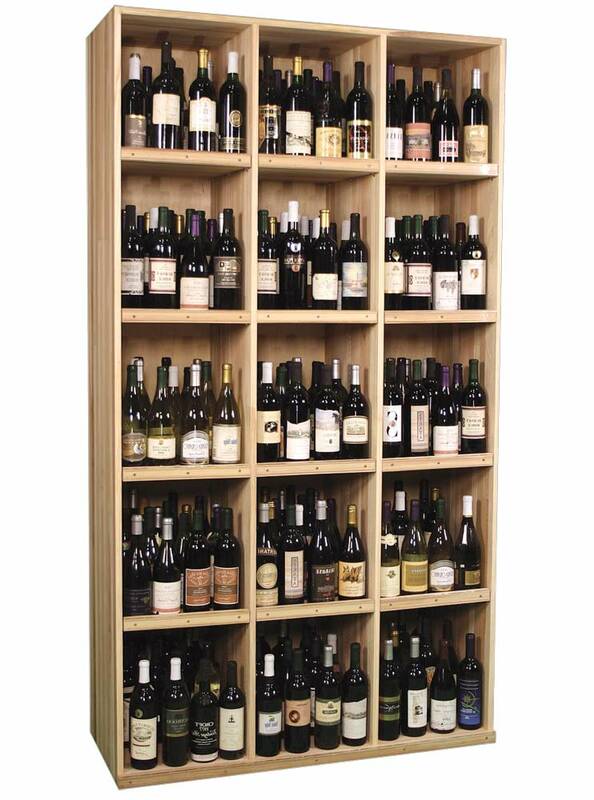 Half Height Adjustable Cabinet Features: This half height adjustable shelf wine display cabinet will allow you to use your wine store space more effectively at floor level for storing cases, jug wines and overstock. You can also use them freestanding or back-to-back as an island centerpiece. Perfect for wine, liquor, beer, soft drinks, or any other products you sell. Middle shelves are adjustable to meet all your needs, and the additional shelves can be ordered. Optional Drop-In-Bins and Vinyl Bases are available. Assembly required. Drop-in Bins Features: Optional Drop-In-Bins for the Adjustable Shelf Cabinet allow for easy label recognition from standing height. 3 Bins stack a case or more each. Sold in sets of 3. Assembly required. 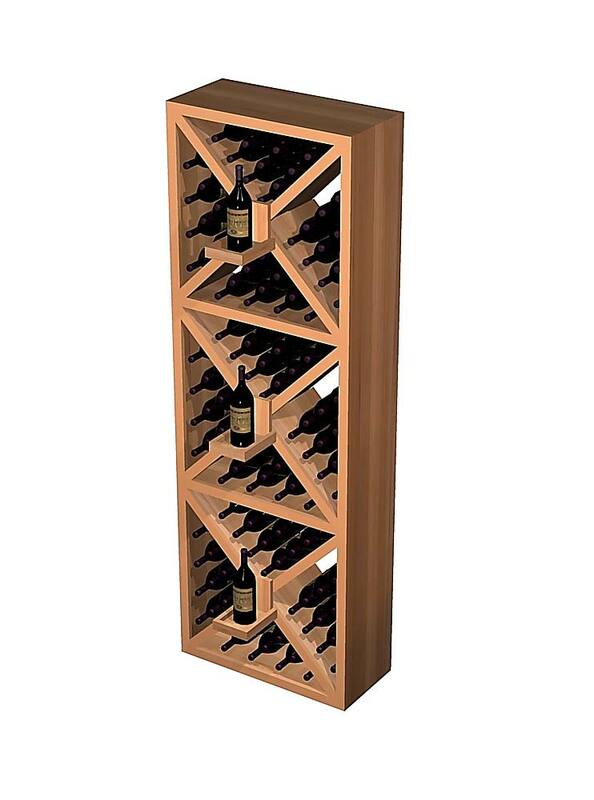 Angled Curved Corner Display Features: Utilize all the space in your store with this angled curved corner wine display. Four bottles are stored behind each wine display, except for 3 bottles stored at the top. Assembly required. Radius Curved Corner Display Features: The Radius Curved Corner Wine Display is another great way to maximize the capacity of your wine store with revolutionary flair. The true radius of the wine display shelf is aesthetically superior and can only be found here in this wine display rack. Four bottles are stored behind each wine bottle display, except for three bottles stored at the top. Assembly required. Quarter Round Shelf Cabinet Features: Six functional wine shelves that can transition around an outside corner or complement your commercial wine display racks on all ends. Assembly required. Quarter Round Display Shelf Features: Seven custom niched wine shelves cradle eight wine bottles each in this Quarter Round Wine Display. Ideal for showcasing your rarest wines. Assembly required. Glass Shelf Accessory Cabinet Features: Light up your sales of wine accessories with this stunning wood storage cabinet with glass shelving. The glass shelf accessory cabinet features built-in illumination and glass shelves which allow for open and prominent display of your products. Comes standard with 4 adjustable glass shelves. Additional shelves can be purchased. Assembly required. 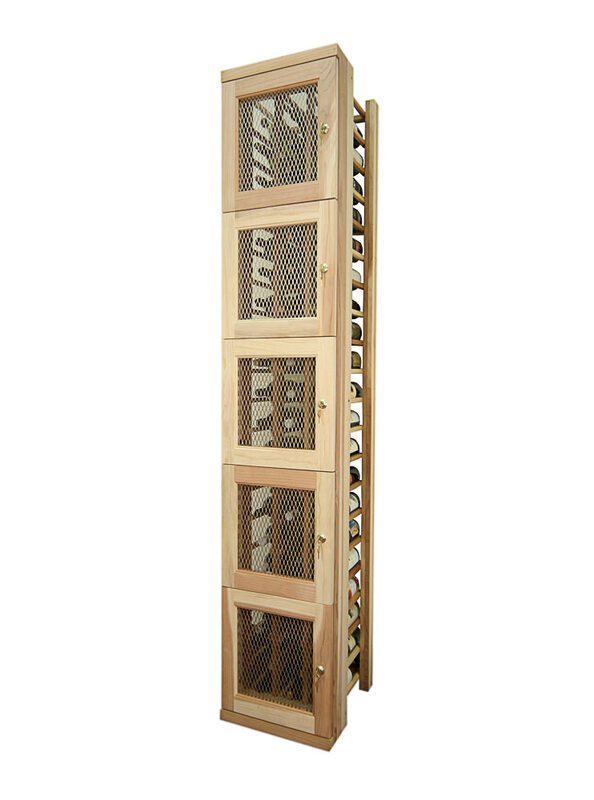 Individual Open Back Locker Storage Features: Utilized in country clubs, wine stores, restaurants, bars, and public storage areas across the country, these secured wine locker storage racks have attractive metal lattice for open air circulation, as well as locks that can be keyed in numerous configurations, or as one single key. These secured wine storage lockers are now offered standard, by the column, to match the existing height of our other commercial wine display racks. Each column contains 5 locker compartments. Sold by the column. Solid panel sides and solid back panels are available for an upcharge. Units are shipped completely assembled, as shown. Solid Panel Upgrades for Individual Locker Storage Features: These upgrades can be useful when lockers are installed openly and security is important to you, but also a wise choice when a solid look and feel is required to complete your cellar’s racking aesthetics. 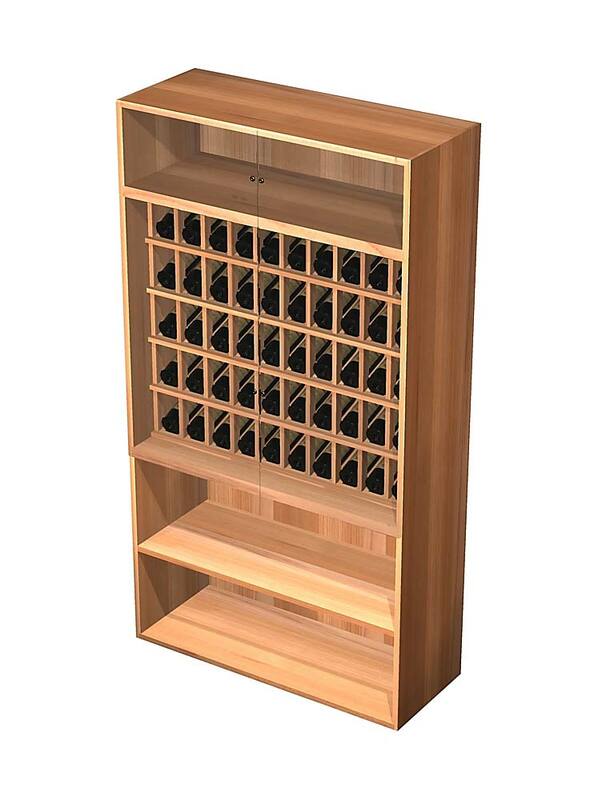 Back - Height: 83 5/8" Width: 15 5/8"
Left - Height: 83 5/8" Width: 16 1/2"
Right - Height: 83 5/8" Width: 16 1/2"
Locking Display Cabinet Features: You can securely display 50 of your most expensive wines in this locking wine display case, while storing other wines in the adjustable space below. The top locks for additional storage of accessories, wine glasses, cigars and more. Assembly required. Diamond Bin Features: This attractive piece sells itself on its eye-catching appeal. Constructed of interlocking solid redwood panels for strength, with optional face trim for beauty. Sold standard without a back or with optional Tongue and Groove paneling. Finishing face trim is included with this product to finish the outside of all the X-interlocks, however it is shipped long and is to be cut to fit on site. Please refer to the assembly manual. Assembly required. 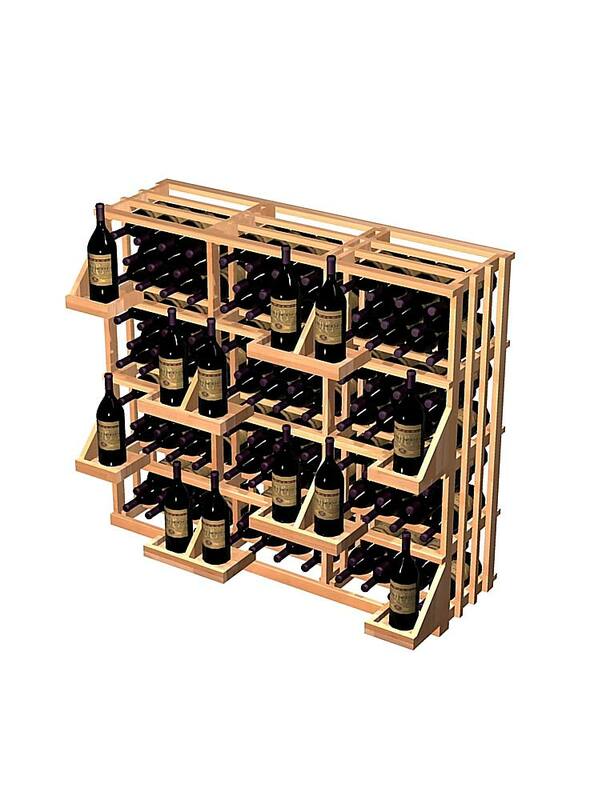 Diamond Cubes Features: The Diamond Cube wine display is perfect for narrow wine storage areas. 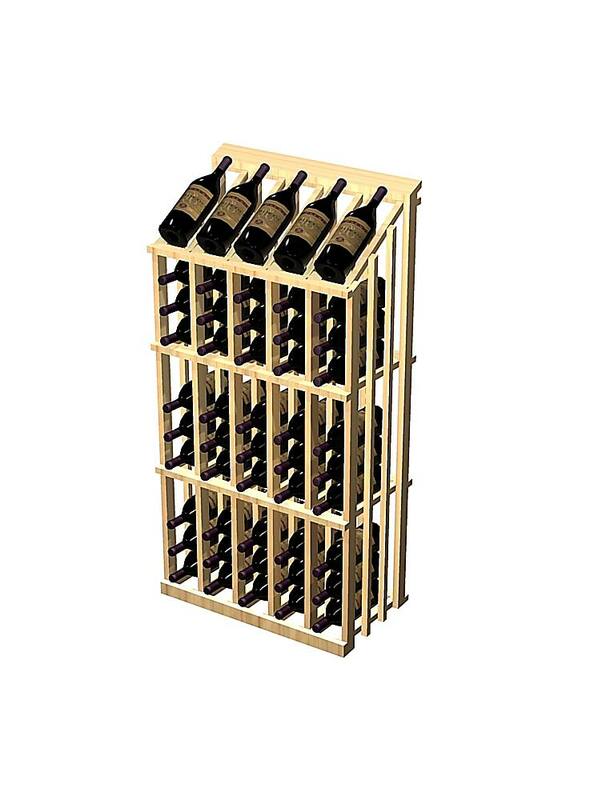 Each wine display rack has 4 cases of back-up bottles for high volume wines. Tie 2 Diamond Cubes together with a built-in tasting center between them to create a dramatic focal point. 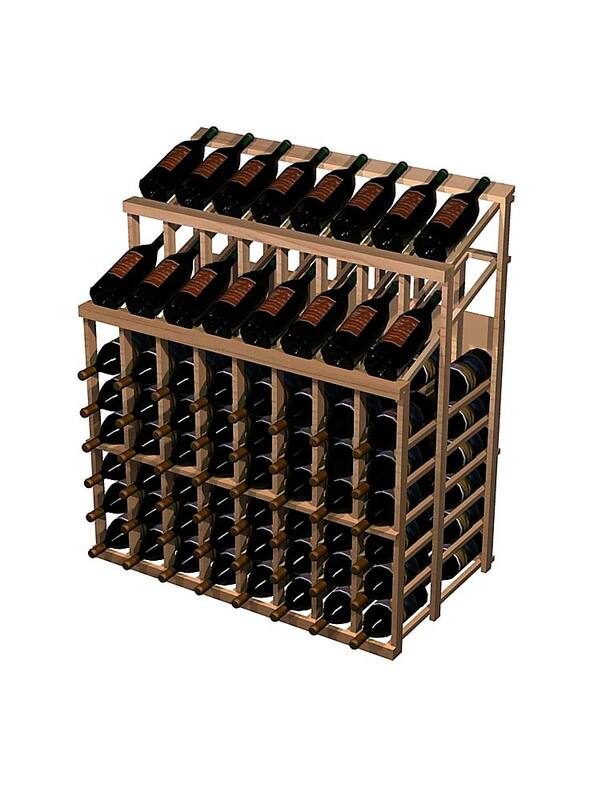 The Diamond Cube wine display rack is sold standard without a back, but optional Tongue and Groove paneling can be purcashed as pictured to create a solid back panel. Paneling sold seperately. Assembly required. 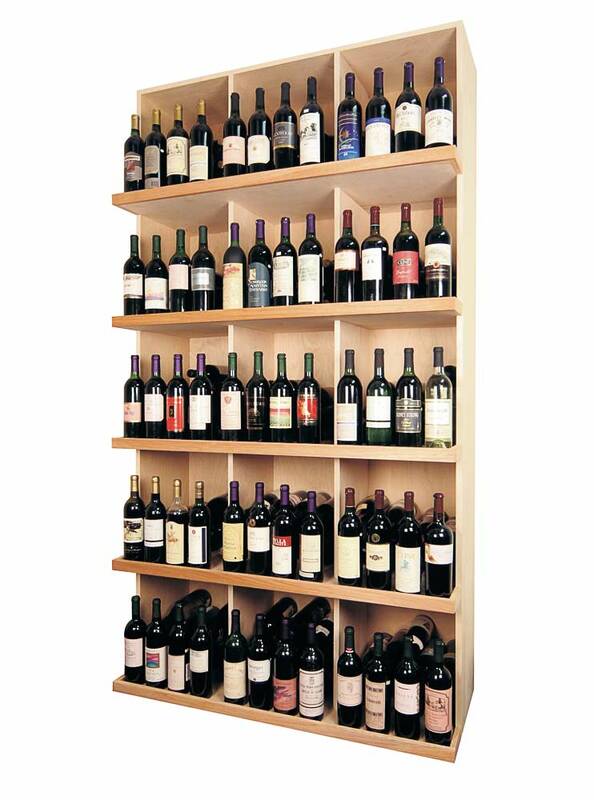 Bin Display Features: The 5 Column Bin Wine Display is one of our best selling commercial wine display racks . These wine display racks are sold in combinations of 2, 3, 4, or 5 columns. Designed to merchandise high volume wines, the resulting sales will make these among the highest producing wine display racks in your store. The display trays hold up to two over sized wine bottles. Assembly required. Contact Us for the additional sizes and capacities for 2, 3, 4 column models. Half Height Bin Display Features: The popular Bin Display is now available in a versatile half height wine storage alternative. This piece is designed to stand on top of our half height adjustable cabinet to match the other full height commercial wine racks. Assembly required. 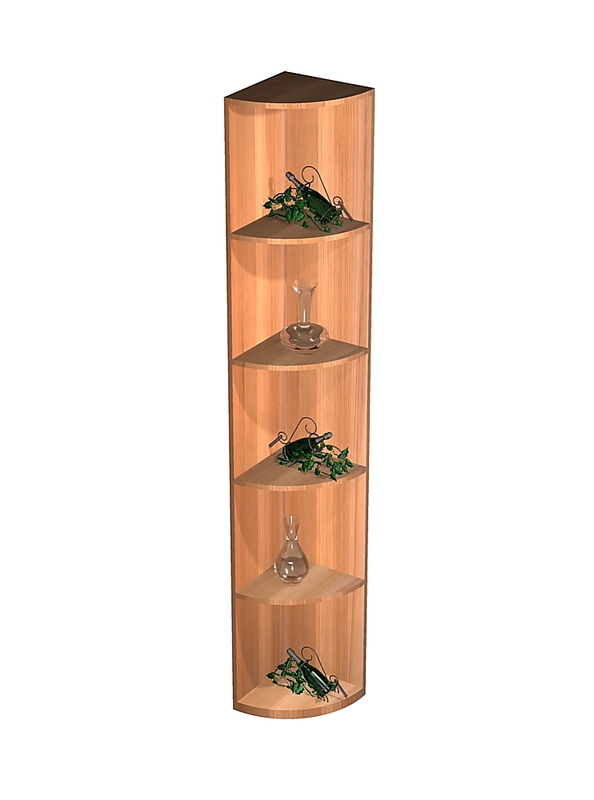 Waterfall End Cap Features: This half round wine display rack completes our waterfall unit. The shelves can be used to display accessories, and the top is an ideal table for wine tastings or featuring select items. Assembly required. Wine Carousel Features: The Wine Carousel allows you to display up to 144 wine bottles in a compact area, allowing you to optimize your retail floor space. This commercial wine display easily rotates for the utmost of customer convenience. Price track comes standard. Assembly required. 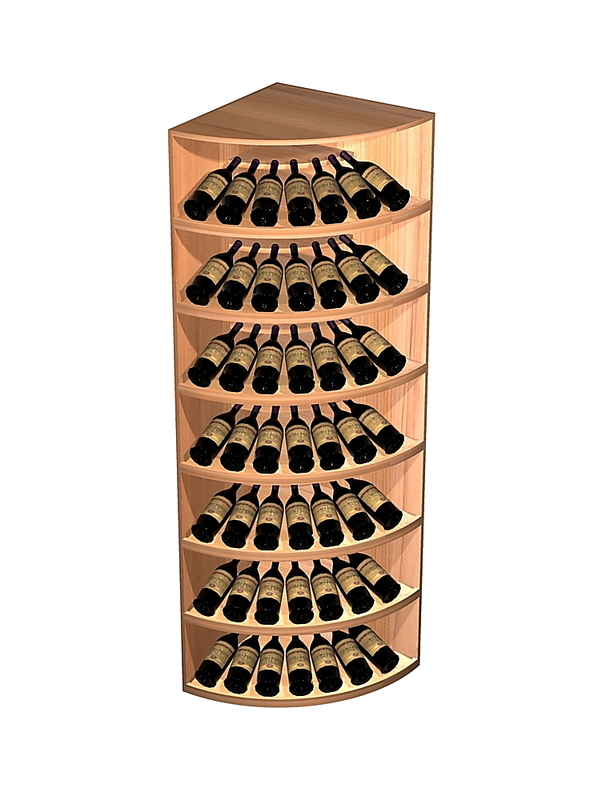 Circular Merchandiser Features: The circular wine merchandiser offers up high wine storage capacity in a compact format. 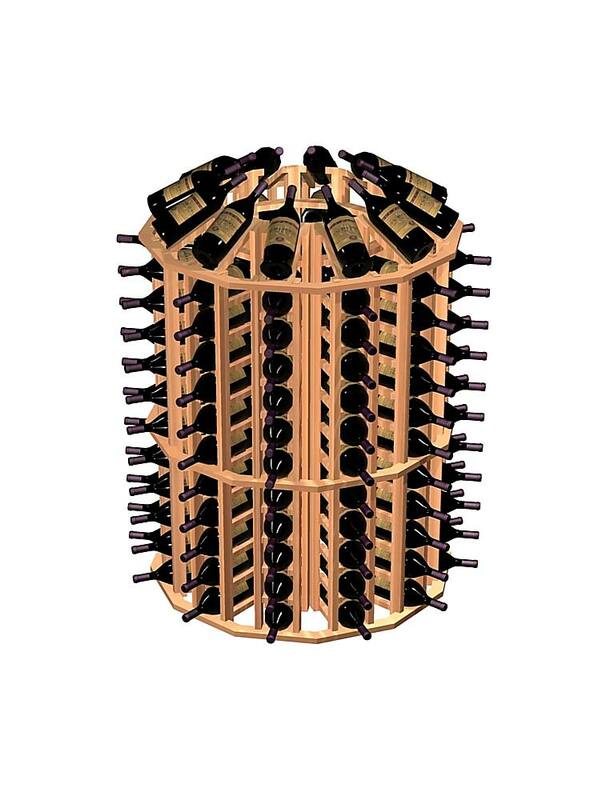 This commercial wine rack is perfect for high traffic areas allowing 360 degrees of visibility. 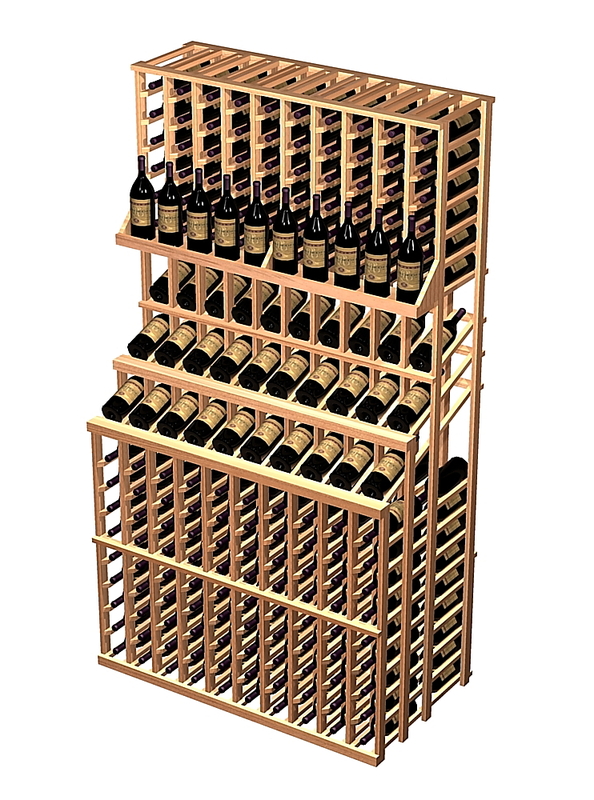 It can even be built around a variety of poles or support columns in your wine store. 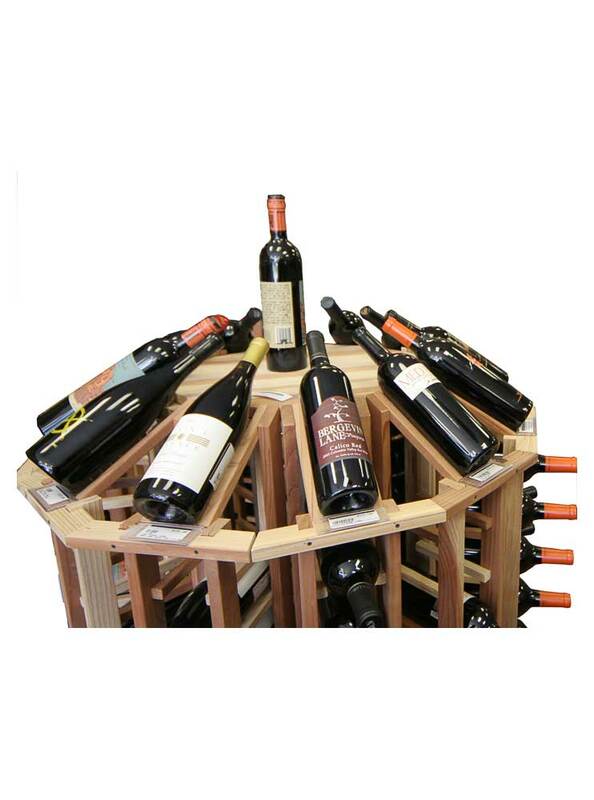 The optional table top becomes a premier wine display location for select brands. 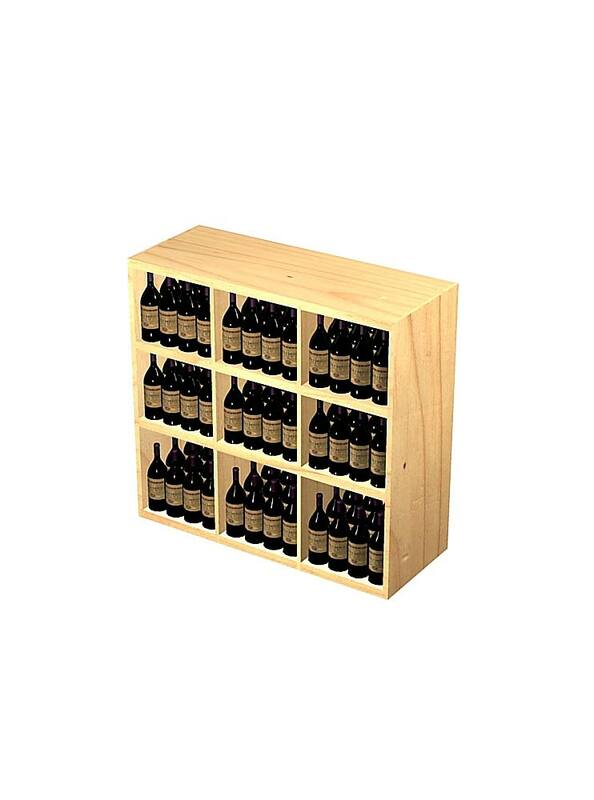 The optional back supports adds 24 additional bottle displays along the sides of the unit. Assembly required. Optional Table Top - Circular Merchandiser The optional tabletop for the circular wine merchandiser becomes a premier display location for select brands. Product only for our Circular Wine Merchandiser. Assembly required. Vinyl Base Option Features: These bases are used in conjunction with the Commercial Display Racks and raise the wine racking off the ground by 4". The vinyl is usually typically only applied to the front of the base, so please be sure to let us know if you require it to be applied on the sides, as well.. The vinyl base is available in brown or black.